But wait ... perhaps we could? The general process of streaming with ffmpeg looks something like the following. First, you run an ffserver instance. It's configured with a number of feeds (usually local files), which provide audio and/or video, and output streams, which are hooked up to incoming connections over RTP/RTSP/HTTP. Our problem is slightly more complicated, in that we need to feed live data to ffserver. 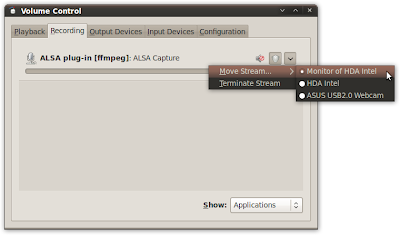 The easiest way to do this is to use an FFM stream: we can configure ffserver with a feed that's sourced to an FFM file, and, once ffserver is running, fire up ffmpeg and tell it to dump live audio and video into the FFM file. Then, a buddy in Utah can connect to the correct output stream and see what we're streaming. Sounds great, right? The remaining piece of the puzzle is getting ffmpeg to capture audio and video from your desktop. Video is easy enough; you can tell ffmpeg to grab a chunk of the X11 display using -f x11grab -s [W]x[H] -r [R] -i 0.0+[X],[Y], where [W], [H], [X], and [Y] represent the width, height, x-offset, and y-offset, respectively, of your desired capture region. Additionally, [R] specifies the desired capture framerate, which should match the one you specify in your configuration file. And that's it! You can tell your friend in Utah to point a streaming client, e.g. vlc, at your stream, and it should just work. Just remember to use your outward-facing IP address, and to make sure the port's open on your router or firewall, if any. For the ffserver.conf above, if my external IP address were 123.45.67.8, the URL I'd send to my friend would be http://123.45.67.8:8090/exile.asf. There is one thing to note: if your friend's client takes a long time to start up, it may be because ffserver's default behavior is to connect clients to the live stream without a delay, which then causes many clients to pause for a number of seconds to fill up a buffer with incoming data as it becomes available. This can be accelerated somewhat by appending a ?buffer=X (where X is a number of seconds) param to the end of the URL; this causes ffserver to start the client on a position in the stream that's X seconds in the past, which enables the client to retrieve those X seconds as fast as bandwidth will allow, thus possibly reducing the time spent buffering. In experimenting, I also found that this cut back on the number of buffer underruns experienced on my friend's end.